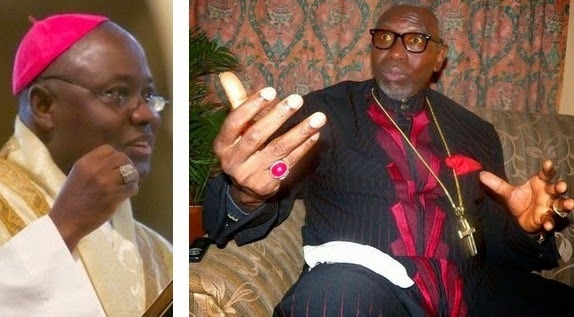 The Catholic Bishops Conference of Nigeria has accused Pastor Ayo Oritsejafor of smearing the image of the Christian Association of Nigeria (CAN), saying it is wrong for his plane to be associated with the scandalous “arms deal” in South Africa. Speaking on BBC Hausa Service monitored in Kaduna on Wednesday, Archbishop Ignatius Kaigama, who is the Archbishop of Jos and President, Catholic Bishop Conference of Nigeria, said they had been watching with sadness how Oristejafor had been hobnobbing with the Presidency for long. He accused the CAN President of dragging Christianity into the mud. He faulted the way Pastor Oritsejafor was running CAN and urged the authorities to investigate the matter dispassionately and ensure that those found guilty are punished according to the law of the land. Archbishop Kaigama said the government should intensify efforts to restore the security situation in troubled parts of the country and expressed worry over the situation in the Northeast.